Maine has heaps to offer tourists and locals alike. After all, Maine is known as “Vacationland.” From our rocky coastline to our dense pine forests and our Western mountains, Maine is the perfect place to discover year-round. If you’re not interested in exploring Maine alone or would like a knowledgeable local to share our history with you, Maine has a variety of awesome guided tours to choose from depending on your interests. Summer Feet Cycling, headquartered in Portland, offers 16 unique Maine cycling tours across the state. Choose from half-day lighthouse tours to a weekend long bike tour of Acadia National Park or even a weeklong adventure up the coast of Maine. Whatever you choose, you’ll have a knowledgeable and professional guide and high quality bikes so you’ll enjoy the beautiful scenery more. Three Rivers Whitewater Rafting has been guiding adrenaline seeking guests down some of Maine’s best rivers for over 21 years. The Kennebec River is Maine’s most popular river for whitewater rafting, but Three Rivers also runs day and multi-day trips down the Penobscot and Dead River. And if you’re looking for the ultimate thrill, pair a trip down the Penobscot River with a skydive! Are you a photographer looking to get the quintessential Maine photo? Try one of the half day or full day photo tours in coastal Maine. Based in historic Rockland, Coastal Maine Photo Tours offers a variety of photo tours by Dee Peppe, a professional Maine photographer. All skill levels and camera types are welcome as you explore the rocky coastline, lighthouses, and lobsters. You can’t come to Maine without experiencing its favorite seafood. Once you’ve tried all the lobster rolls in town, it’s time to try catching one. Lucky Catch Cruises offers Maine Lobstering Tours allowing you to get up close and personal with some of Maine’s real lobstermen. Each tour lasts for about 90 minutes and you’ll learn more about your dinner and how to catch one. Afterwards, you can purchase your catch as the “boat” price. Maine Coast Explorers was started in 2007 to connect visitors with the incredible natural system and landscape of Maine. Maine Coast Explorers offers a range of year-round tours and can also make custom made tours based on your interests. 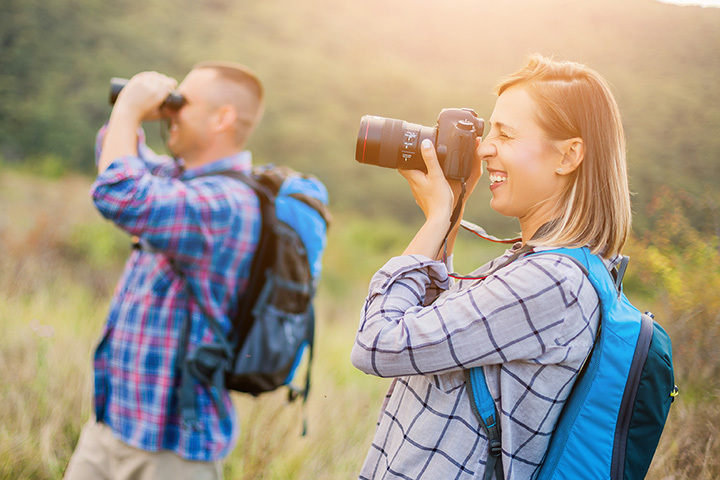 Choose from sightseeing, photo, cultural, and even fitness tours. Tour pickups can be anywhere from Kittery to Portland. Maine Foodie Tours runs food-based walking tours in Portland, Bar Harbor, Kennebunkport, Rockland, and Camden. As a foodie state, Maine has some pretty amazing foods to try from lobster to blueberries to locally-brewed craft beers and mead. What better way to sample a taste of Maine with a walking food in several of Maine’s foodie towns. Have you ever dreamed of seeing a moose in person? Join one of the Moose and Wildlife Tours at the New England Outdoor Center in Millinocket. Head out on the pontoon boat on Millinocket Lake or hop in the van and explore the northern woods in search of Maine’s famed creature. And if you can’t see a moose, you’ll see other animals like bald eagles, loons, whitetail deer, and maybe if you’re very lucky, a black bear! Hop aboard the steam locomotive, Monson #3, and explore the Sandy River and Rangeley Lakes Railroad by train. Every weekend during the summer, you can enjoy a short ride and a guided tour of the original rail bed of what was Maine’s largest narrow gauge railway. As one of the oldest settled states in the country, Maine has a long history. Lit by a lantern by a lady wearing a red cloak, discover some of Maine’s best coastal towns through their ghosts, history, spirits, and mysteries. Choose from lighthouse tours or cemetery tours in Bar Harbor, Camden, Damariscotta, and more. Don’t blame them if you can’t sleep later that night! You’ll find some of the best rock climbing in Maine on Mount Desert Island. Acadia Mountain Guides Climbing School is Maine’s foremost climbing school offering courses and tours in Acadia National Park, Camden Hills, and Mount Katahdin. Choose from half day or full day courses.